From the makers of the smash-hit musical The Gruffalo Live, Room on the Broom is thrilling Local Mums and kids in the West End this Christmas. The musical adaptation of the best-selling book by Children’s Laureate Julia Donaldson MBE and Axel Scheffler is aimed at ages 3 – 8 years old and is a fantastic introduction to theatre for pre and primary school children and their families. Expect enchanting puppetry, sing-a-long songs and hilarious fun for everyone. Brought to the stage by internationally acclaimed theatre company Tall Stories, the creators of the smash-hit production The Gruffalo Live, Room on the Broom is presented by Kenny Wax and Nick Brooke, directed by Olivia Jacobs, alongside Toby Mitchell as Creative Producer (both founders of Tall Stories), with lighting design by James Whiteside, design by Morgan Large, puppet design by Yvonne Stone and music and music design by Jon Fiber and Andy Shaw of Shock Productions. Room on the Broom magics up a spell-binding brew of comedy, puppetry and songs that had kids and mums enchanted - and giggling madly - from start to finish. The fun begins with a game of hide and seek between cast members and audience, all before the curtain comes up. Then the actors are back on stage playing four characters on a camping trip who spot what appears to be a witch and her cat zooming by on a broom. After a crash landing we meet the witch and her feisty, feline friend, who lose a hat, bow and wand on their travels but gain a friendly frog, a daft dog and a beautiful bird for their troubles. After the host of charming characters bring the house down with their antics it’s a happy ending �all round complete with souped-up broomstick and catchy singalong. 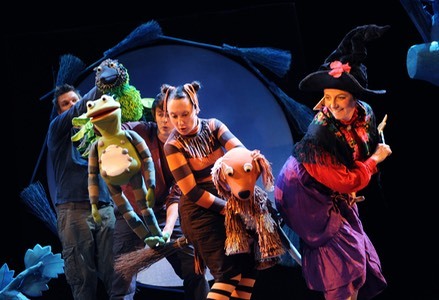 Room on the Broom is a magical production full of fun and laughter for kids and parents alike. School and Group bookings of 10+: �9.50 Buy 10 tickets get the 11th ticket free. For School & Group bookings call 0844 482 9678.